The king has returned, and it wants its crown back. Nokia has licensed the Finnish company HMD Global to produce handsets with the iconic brand, and it's been doing a pretty good job so far. Three Android smartphones have already been released, which took some emerging markets by storm. The Nokia 6, Nokia 5, and Nokia 3 are not bad phones at all, but they aren't what the Western market wants or needs. 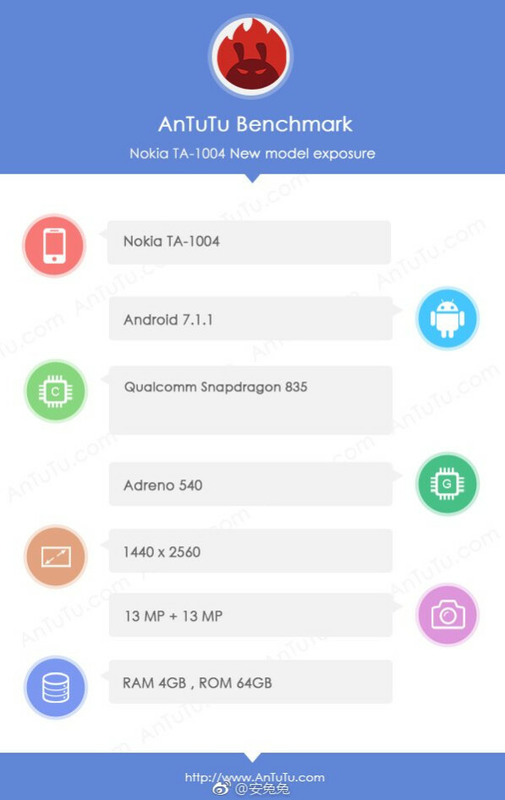 This is why HMD is prepping a whole new device, the Nokia 9, which will compete with the rest of the flagships out there. HMD Global has taken a huge responsibility – to do the iconic brand justice, and produce high-quality smartphones that will cater to most needs. The Nokia 6 has already proven to be a sturdy mid-ranger that's worth its price, so we can't wait to see how the Nokia 9 fares. Until HMD officially announces its flagship, though, we'll have to go by whatever leaks and news we manage to come across. Here's what we have so far. We already have a very solid leak, when it comes to the device's looks. A leaked promo video, showcasing four Nokia smartphones emerged a while back. What's interesting is that only three of them are released so far. It is only natural to assume that the fourth handset is the Nokia 9, especially considering it has all the characteristics of a flagship – a good-sized screen, dual camera and a sleek design. We expect that the Nokia 9 will not go for the glass-sandwich form factor, but for sturdy aluminum unibody, similar to the Nokia 6. Leaked photos of an alleged Nokia 9 prototype seem to give more weight to this assumption. The device is encased in a plastic box, hiding most of its design, but what is visible appears to hint towards a metal back, complete with a Gorilla Glass front and plastic antenna lines on the top and bottom. The device will also come with a vertical dual-camera setup on the back, a home button (which will probably double as a fingerprint scanner) on the front, and capacitive navigation buttons on either side of the home button. The Nokia 9 is expected to have a 5.3-inch screen, with the classic 9:16 aspect ratio. It will probably use the same technology as the Nokia 6 – IPS LCD. This will make it more power-hungry than an OLED alternative, at least in theory, but it will also have a longer lifespan. The Nokia 9 is expected to feature the latest and greatest Qualcomm silicon – the Snapdragon 835. This system-on-a-chip powers the Samsung Galaxy S8, Galaxy S8+, and Sony Xperia XZ Premium as well, among others. It's currently the go-to flagship chipset for just about any manufacturer, so it's no surprise that HMD has chosen it too. In terms of memory, the device is expected to have 4GB of RAM and 64 GB of internal memory. In some markets, HMD might opt for a version with 6 GB of RAM and 128 GB of storage, but the US is unlikely to get that model officially. As mentioned before, the handset will come equipped with a 5.3-inch LCD display, which will boast a 1440 x 2560 (Quad HD) resolution, and a classic 9:16 aspect ratio. Nothing has been leaked regarding the Nokia 9's pricing. However, we can look at the other three HMD handsets, and draw some conclusions. If the Finnish company assumes the same strategy as with the Nokia 6, the device will be priced slightly below its competitors, but not by a wide margin. We expect that the Nokia 9 will be in the same price range as the Sony Xperia XZ Premium, and it will sell for about $800, give or take. With the Samsung Galaxy S8+ selling for $999 (with no discounts), and the iPhone 8 rumored to be around the $1,000 mark as well, Nokia might have the edge in that regard. Nokia and HMD have repeatedly confirmed that all Nokia-branded handsets will be available around the world by the end of June, 2017. Of course, they're referring to the current models – the Nokia 3, 5, and 6. We're aiming to release worldwide in Q2 2017 (May - June). We can't be more specific than this. Please stay tuned to our social channels. In fact, these devices have already made it to a lot of countries around the globe, but what about the alleged Nokia 9? What we know so far is that the device has passed its FCC certification, and it will probably be available in the US, because HMD has confirmed plans to eventually bring its other handsets to the US. Considering the substantial amount of leaks and rumors recently, we can safely assume that the announcement will follow very soon. If we were to put our money on when exactly, we'd guess that the handset will be unveiled by the end of Q2, but some rumors suggest that it might be as late as August of this year. Either way, there isn't much time left, so stay tuned for more updates. The screen is okay for FHD. QHD is overkill for this screen. Especially since LCD's don;t have pentile-rgb-matrix and hence are sharper at FHD then their AMOled equivalents. I feel like QHD on a LCD screen works pretty good if done right. I have it on my Axon Pro and it looks better than the AMOLED my S7 Edge. It's not as bright but the colors look more true and not over saturated. It's easy on the battery to. When I tried to watch HD videos, the S7 Edge always have frame drops and wouldn't work unless I changed the video to 720p but the Axon is handling 1080p and 1440p video just fine. Moto XT1225 is the "international" version of the Droid Turbo. Probably has 5.5", not the reported 5.3". Frandroid didn't actually measure the screen. See detailed reply below. I have 5.2" 1440p AMOLED on my 2014 Moto XT1225 and it's FANTASTIC. You think 5.5" is small? Nokia 9 will probably have 5.5" display -- NOT 5.3". Some spec apps don't display screen size correctly, especially when the phone has capacitive buttons -- like the Frandroid pictures showed. My 5.2" 1440p AMOLED Moto XT1225 shows up as 4.59" for some reason on one of the display spec apps I use. Too many other rumors says the Nokia 9 will have 5.5" to discount them. Just because the Frandroid picture showed an app that SAYS the screen is 5.27" does NOT mean it's really 5.27". The app may be wrong. They didn't actually measure the screen, you know? Because the phone was encased in a blue plastic block. Why don't you do a surface mobile rumor review? Because only 3 people care. Not click-worthy. Available Ram. 867MB..... What the heck? 6in like my 1520 but with smaller bezels would be nice. I'm sorry. But the Nokia flagship I knew used to have a Camera button. This isn't Nokia. Where is 1520? 1020? It's a pity that HMD only seems to concentrate on the asian markets and seem to forget EU/US :-( For me it doesn't matter anymore. My last Nokia was the glorious 808PV. As General O.W. Kenobi would say: "...these are not the droids you're looking for!" As I understand it Nokia 3, 5 and 6 rolling out in Europa now. We will have all avaible within 1 or maximum 2 weeks. So they have dealers and service centers in place. So I suppose a Nokia 8 or 9 might not be so far away. But I dont know if and when they coming to the US market. Nokia 9 MAY have 5.5" display -- NOT 5.3". Some spec apps don't display screen size correctly, especially when the phone has capacitive buttons -- like the Frandroid pictures showed. My 5.2" 1440p AMOLED Moto XT1225 shows up as 4.59" for some reason on one of the display spec apps I use. Too many other rumors says the Nokia 9 will have 5.5" to discount them. Just because the Frandroid picture showed an app that SAYS the screen is 5.27" does NOT mean it's really 5.27". The app may be wrong. They didn't actually measure the screen, you know? Because the phone was encased in a blue plastic block. Take my money, HMD with your Nokia-licensed devices (finger to "That's not a Nokia" Fuccbois).